The biggest known carnivorous marsupial of the modern era – the Tasmanian tiger – or thylacine – went extinct in the early 20th century. 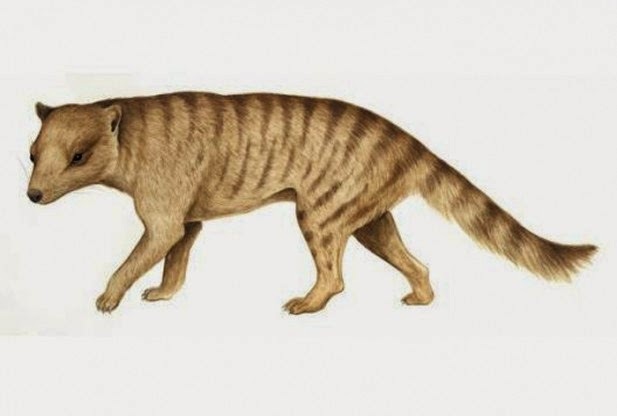 Now, researchers have found that a distant, ancient relative of the thylacine was able to hunt down prey larger than itself, according to a new study in the open-access journal PLOS ONE. Based solely on a recovered 16- to 11.5-million-year-old skull, the study team was able to create a virtual three-dimensional model of the fox-sized carnivore called Nimbacinus dicksoni and compared that model to models of other large living marsupial carnivores, including the Tasmanian devil and Tasmanian tiger. The team’s comparisons revealed similarities to the mechanical performance of the spotted-tailed quoll, a cat-sized carnivorous marsupial native to Australia. The mechanical similarities told the study team that N. dicksoni had a strong bite force for its size, was mostly carnivorous, and was probably capable of taking down vertebrate prey that weighed more than itself. “Our findings suggest that Nimbacinus dicksoni was an opportunistic hunter, with potential prey including birds, frogs, lizards and snakes, as well as a wide range of marsupials,” said study author Marie Attard of the University of New England in a statement. “In contrast, the iconic Tasmanian tiger was considerably more specialized than large living dasyurids and Nimbacinus, and was likely more restricted in the range of prey it could hunt, making it more vulnerable to extinction,” said Attard, who worked on the study as part of her doctoral research at the University of New South Wales in Australia. UNSW researchers have been working in the Riversleigh World Heritage Fossil Site where the skull was found for 37 years. “What makes this study of mechanical capacity possible is also what makes Riversleigh globally so stunning – a deliciously high biodiversity of weird and wonderful creatures, and simply extraordinary preservation,” said study author Mike Archer, a professor in the UNSW School of Biological, Earth and Environmental Sciences. The study team noted that the cave where the N. dicksoni skull was found has also produced hundreds of other valuable fossil specimens. “The Nimbacinus skeleton was one of the first and most amazing things we encountered in the AL90 deposit. Apart from the modern species, it is the only other extinct thylacinid skeleton known and has provided many insights into the evolutionary origins and behaviors of Australia’s carnivorous marsupials,” he continued. “We found, from the posture of the skeleton, that it had given up trying to get out of the cave into which it had fallen so long ago. It had folded its arms, and put its head down for a quiet little 15 million-year-long nap. Hence, we nick-named it the ‘Philosophical Thylacine’,” Archer said.